Roy Chowdhury T, Herndon EM, Phelps TJ, Elias DA, Gu B, Liang L, Wullschleger SD, Graham DE. 2015. Stoichiometry and temperature sensitivity of methanogenesis and CO 2 production from saturated polygonal tundra in Barrow, Alaska. Global Change Biology. 21(2):722-737. Cohen LR, Raz-Yaseef N, Curtis BJ, Young JM, Rahn TA, Wilson CJ, Wullschleger SD, Newman BD. 2015. 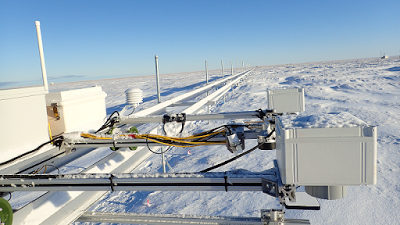 Measuring diurnal cycles of evapotranspiration in the Arctic with an automated chamber system. Ecohydrology. :n/a-n/a. Figure 1. 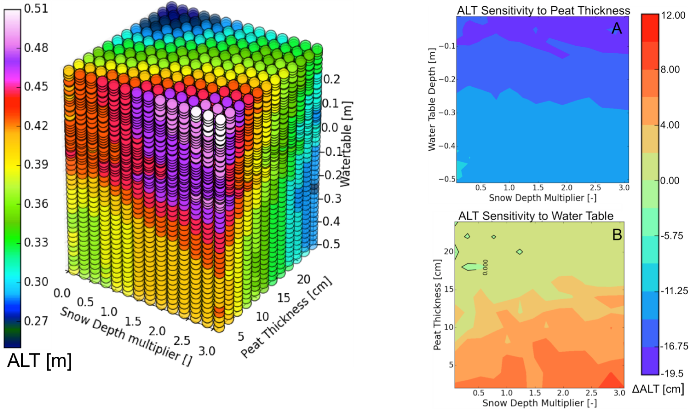 An ensemble assessing the relative effect of snow depth, peat thickness, and water table depth on active layer thickness (ALT) is shown on the left. Plots on the right show the sensitivity of ALT from peat (top) and inundation state (bottom). Peat demonstrates the strongest control (largest magnitude sensitivity), while the sensitivity of ALT to inundation state is highly dependent upon peat thickness. Both manuals were updated with additional contact information. Participants and collaborators are strongly encouraged to complete all training requirements prior to travel because computers and internet connectivity are limited in Barrow. Training materials are only available on the NGEE-Arctic project website (https://ngee-arctic.ornl.gov/content/ngee-safety). Access to training materials requires NGEE-Arctic website login. After login, the Safety tab will appear. ORNL participants may access Training Materials with their ORNL UCAMS login UID and PWD. Other participants and collaborators may access Training Materials with their website UID and PWD. If you are not a registered website user, please request an account (Login tab). You will receive e-mail notification with your account information. Note that it may take 24 to 48 hours for your account to be established. Upon successful completion of the training requirements you will receive e-mail notification from NGEE-Arctic Management that you are approved for field and laboratory work at the NGEE-Arctic facilities in Barrow. 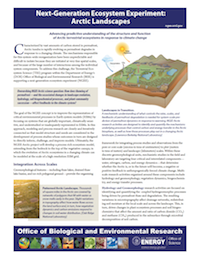 NGEE Arctic brochure highlights project goals of advancing predictive understanding of the structure and function of Arctic terrestrial ecosystems in response to climate change. Click to download..